Following the Live Test series, most recently with The Epic Split, Volvo Trucks now premieres “Look who’s driving”, which according to Volvo Trucks is the toughest test yet. An unpredictable child and a radio-controlled 18 tonne truck. In Volvo Trucks' “Look who’s driving” four-year-old Sophie subjects the Volvo FMX to the toughest challenge yet in the Live Test series. The film is a follow-up to previous global successes in the series, such as The Epic Split and The Hamster Stunt. Once again Volvo Trucks is pushing the boundaries of what is humanly possible – or at least possible with a truck. 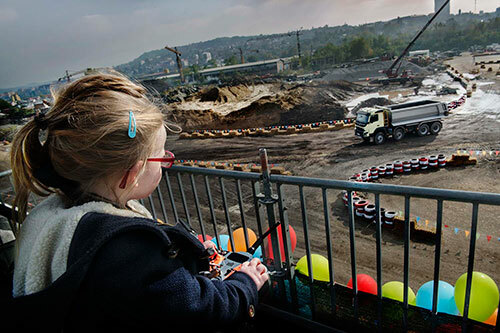 In the most recent Live Test, “Look who’s driving”, four-year-old Sophie drives an 18 tonne Volvo FMX through a construction area using a remote control. Sophie puts the truck through some serious manoeuvres, including driving through a thick brick wall and climbing a steep, soft slope, before rolling all the way down in a full 360-degree turn. Over the year, the truck has been given several new functions, such as the Automatic Traction Control – an all-wheel drive system that kicks in automatically when needed. With the “Look who’s driving”, Volvo Trucks wants to show how much the truck can tolerate.